Macarons are incredibly finicky. Sometimes, they develop those cute little feet and are just perfect. Other times, the feet are all over the place! I’ve tested out a few different recipes, and while some tips do help, some of the common “rules” around making macarons can be disregarded. The ideal macaron should be a perfect circle, with “feet” along the edges, where it has risen in the oven. They should comfortably slip off your baking mat. They also should be slightly chewy, yet crunchy, and they should taste like heaven. Kitchen scales are very useful for making macarons, as proper measurement of the ingredients ensures the best results. They’re also relatively cheap. That being said, I usually make macarons with cup measurements, and have been successful , so it is not a necessity! I highly recommend buying a silicone baking mat, they’re amazingly useful, easy to clean, and last forever. Use almond meal (finely ground almonds)! It’s not worth grinding up your own almonds. This will save you quite a bit of time, and clearning. Random note, if you do chose to grind your own nuts, you can use different types of nuts! Common replacements include pistachios and hazelnuts. Most recipes tell you to add the granulated sugar into the egg white gradually, but it’s a LIE! I’ve gradually added, and dumped all the sugar in at once, with no difference in my end product. Double stack your baking sheets to ensure that the pans heat evenly. Use a piping bag with a round tip. I already have these on hand because of the cakes I bake, but they are pretty cheap to buy if you don’t! Piping bags and tips allow better control when piping the circles onto the mat for baking. You can use plastic bags, as long as they are the sturdier, freezer-type bag. Just cut a hole in the corner about 1 inch wide. 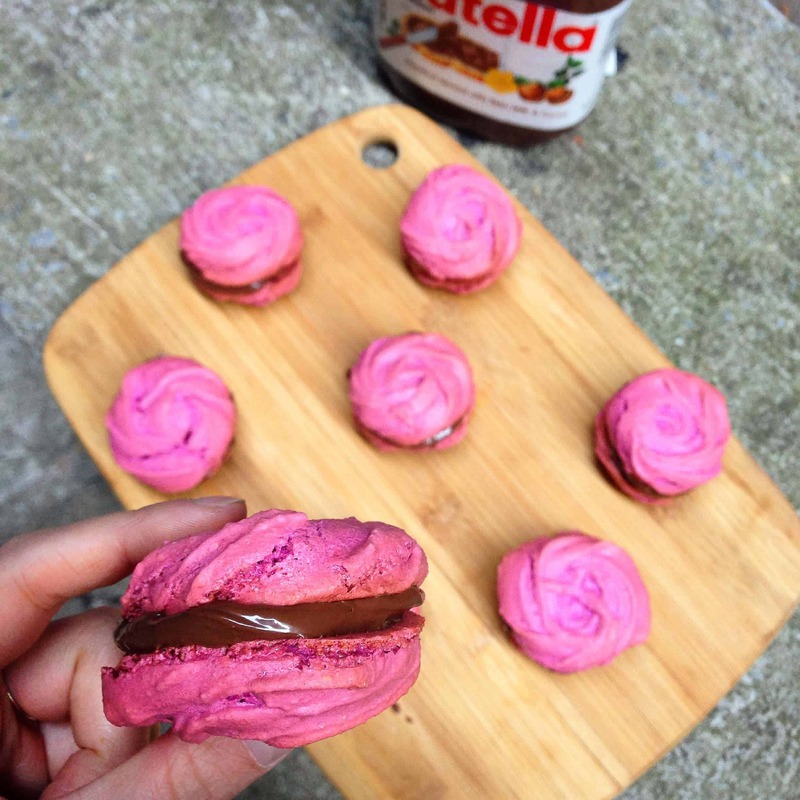 If you are going to color your macarons, use gel food coloring instead of liquid. Liquids can mess with the consistency of the macarons, and ruin the texture. Also, make sure you add the coloring to the egg mixture while beating in the sugar, to ensure even distribution of the color. When you are beating the egg whites, most instructions tell you to beat until glossy/stiff. I’ve found you should take it one step further, and beat them until they literally don’t move when you turn your bowl over. You should be able to hold the bowl over your head, and have NOTHING move. That’s when you know the egg whites are ready! When folding the egg whites with the almond meal and sugar, use a flexible spatula. Make sure you’re folding motion is gentle, and that you repeatedly scrape around the bowl and move batter towards the middle. DO NOT OVERMIX. You should make no more than 50 folds. Many recipes say the consistency should be of lava, but if your mixture resembles runny pancake batter, you’ve gone too far. After piping the macarons, tap the tray against your countertop on the sides of the tray, to make sure any air bubbles are released. After piping the macarons, let the tray sit out for at least 25 minutes, until the tops of the macarons look dried out and are no longer spreading. This is the skin that needs to form in order for the “feet” of the macaron to properly develop. When the weather is humid or rainy, it can negatively affect the macaron shells. The extra moisture can interfere with the development of the skin that should form during the resting stage. Halfway through baking, rotate the pans in the oven. In my experience, my oven heats a bit more on one side more than the other. Most ovens do not bake perfectly even, and this will help ensure consistency throughout your final product. 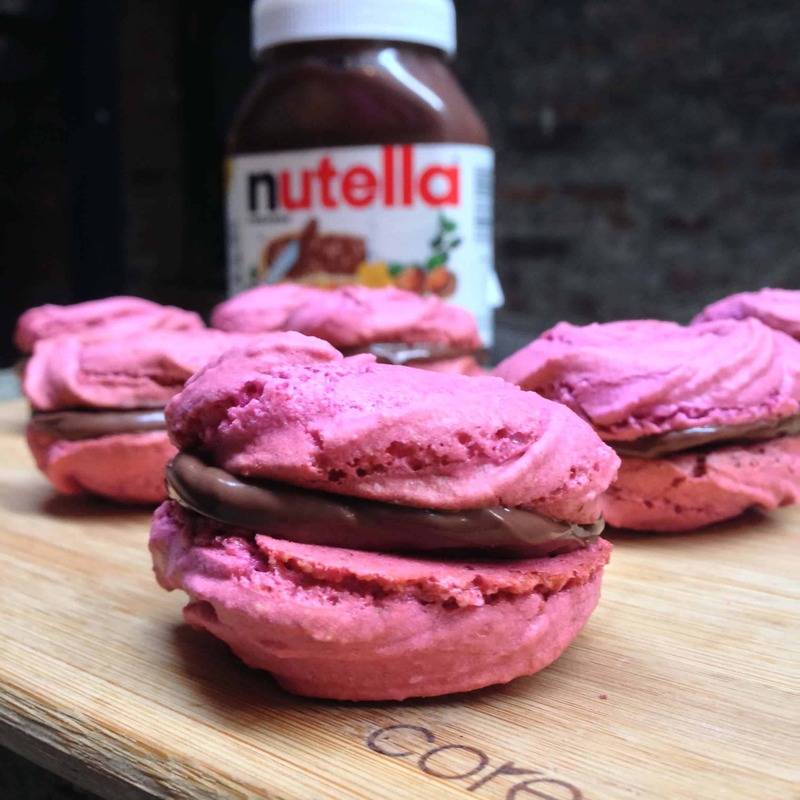 I have tried out a lot of online recipes for macarons, and this one has worked the best for me. I have continued using this recipe as a base, altering it to test out different flavors. Begin by preheat the oven to 320 degrees Fahrenheit, and line a cookie sheet with parchment paper, or a silicone mat. 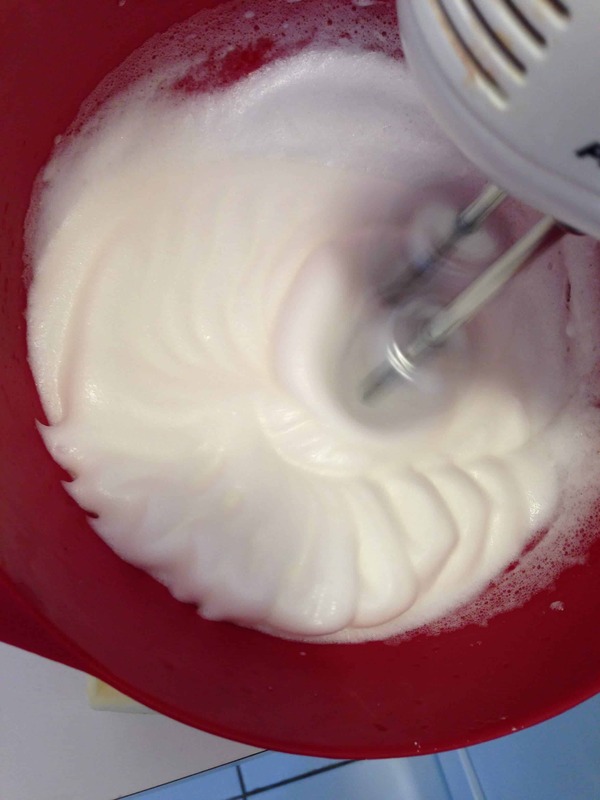 In a large bowl, beat the egg whites with an hand mixer until they form peaks. Slowly add the granulated sugar, while constantly whisking. Add in the gel food coloring. Whisk until the mixture becomes glossy, and is very stiff. Divide mixture evenly between two bowls, coloring one with pink food gel, and coloring the other one purple. Sift the powdered sugar and almond meal into a bowl. Gently fold this mixture into the meringue mixture, until everything is just incorporated.Pour the batter into a piping bag with a 1cm opening (I used a plastic bag and cut off the corner) and pipe 1 inch rosettes (using a closed star tip) onto a lined baking tray. Pipe from one side, at a 45 degree angle. Tap the tray firmly against the table, to remove any large air bubbles. Set these aside until the the tops of the macarons have developed a skin (about 30 minutes). Bake for 15-20 minutes, or until the bottom of the macarons are firm. Feet should have developed around the base of each cookie. Due to the rose shape of these macarons, the feet developed at interesting angles, but were there none the less! Interesting shapes. I’ve never made Macrons, they look too hard for me.